1. Place jewelry in a heat-proof bowl. 2. Heat 2 cups of water almost to the point of boiling. 3. Add a couple drops of dish soap, one tablespoon of white vinegar and mix to combine. 4. Pour the solution over jewelry, swirl it around a bit and let it soak until the water is cool. 5. 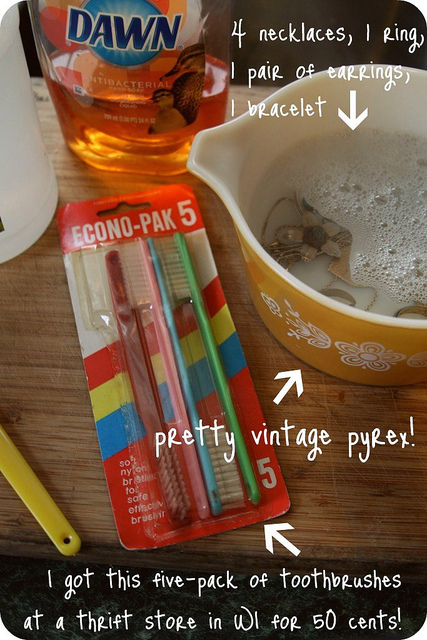 Brush jewelry with a toothbrush under running water and leave to air dry on lint-free rag or cloth. And…voila! 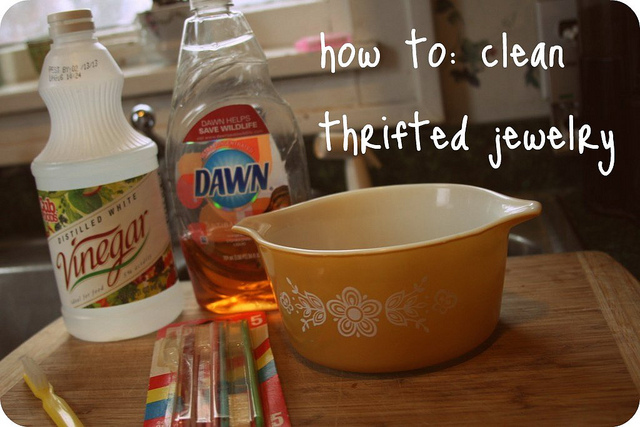 Your thrifted accessories are sparkly and clean! Hannah wanted me to mention that this method is perfect for people with skin allergies or sensitive skin—many drugstore jewelry cleaners have ammonia in them which can be irritating and harsh. I hope you all are having wonderful Wednesdays so far! It’s snowing like crazy here and I’ve got a long day of editing and interviews ahead. But tonight, I’m trekking to Dinkytown to see this band play, so I can’t complain too much not going to see Warpaint because they are snowed in. So excited sad! This entry was posted in How-Tos and tagged domesticity, how to, music, thrifting, vintage by highplainsthrifter. Bookmark the permalink. And now I know what I’ll be doing tonight! Thanks for the tutorial. Sweet! Let me know how it went!